Q. What is RSS? A. RSS stands for Real Simple Syndication. 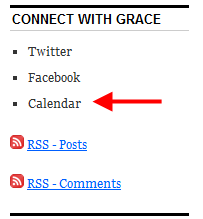 We utilize RSS on our website so visitors can easily follow our posts and comments. They can use RSS readers such as Google Reader, Firefox, Thunderbird, etc. Readers are like an online newspaper that automatically brings in new content from the sites you subscribe to. More information on RSS can be found at Google and on Wikipedia. Q. Is our church’s main calendar online? A. Yes it is! Look for the Calendar link on the home page as seen below.